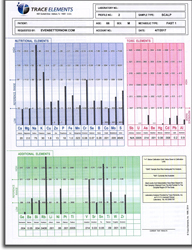 For those of you who have purchased a comprehensive hair analysis (Profile 2) from us before by Trace Elements, Inc., you can have a re-test done that will show you a comparative analysis of the current results with the previous results. This re-test is referred to as a Profile 3 analysis. Recommendations of specific foods and food groups, along with an explanation of why each individual food is suggested. Modifications in supplement recommendations as indicated from the tissue mineral analysis and other accompanying clinical test data. As with the original test, we will mail you kit via USPS Priority Mail and a copy of the results to you via First Class mail. Cost of mailing the hair kit and report is included in your price. You can opt to not have an electronic copy sent by email by selecting the radio button below. If you would like to review the instructions for taking your hair sample again, please click here. We recommend this hair tissue analysis as the most thorough and comprehensive way of charting your detoxification process and getting a detailed blueprint of your nutritional metabolic activity. Please Note: A re-test only applies to Trace Elements hair analyses that were purchased through Evenbetternow, LLC, and not from a doctor or other distributor. You cannot use a Profile 3 Re-test unless you have a Trace Elements laboratory number from a previous hair analysis report. Although the Profile 3 Hair Analysis Re-test comes with a full written report as outlined above, we recommend a personalized deeper review and consultation to help you further understand the results of your test, how they relate to your previous test, and the evaluation provided by the lab. Have a Pet? We now offer the hair analysis for dogs and horses. Please Note: We do not offer refunds on any hair analysis tests or consultations once you've purchased them. Keep in mind the hair analysis kit submittal form you receive is valid for up to one year in case you need to wait before submitting your hair sample.